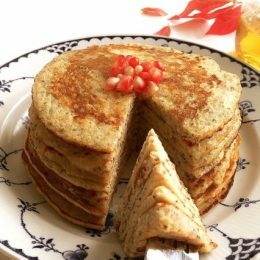 These banana pancakes in a snap are naturally sweetened by the ripe bananas and are filled with antioxidants, fiber and protein that the chia seeds provides so you can serve this treat completely guilt free. 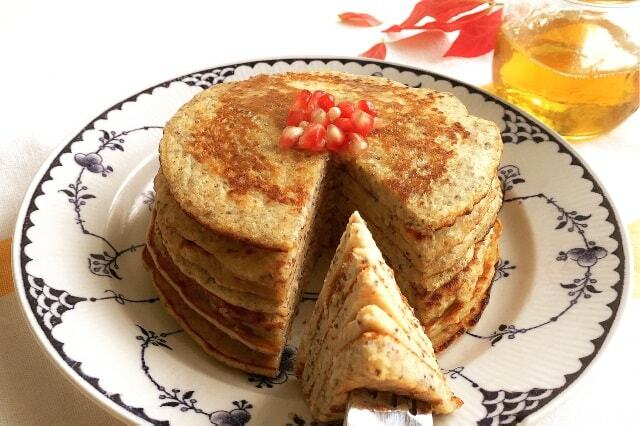 The chia seeds also adds a crunchy texture to the pancakes which makes them even better. 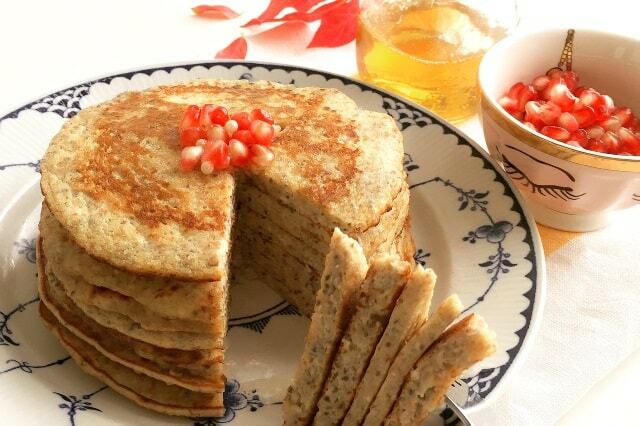 You can also top the pancakes with your favorite berries and fruit but it is also good just as it is. Another great thing about this recipe is that you can freeze it and reheat it for another family breakfast whenever you or yours crave it. It’s also easy to make. 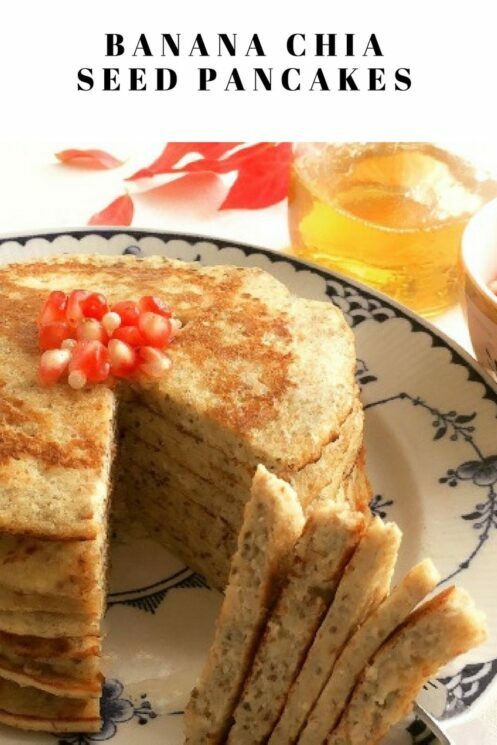 Simply whisk together the ingredients until the mixture turns into a thick liquid, the typical pancake consistency. It’s a shame these days how the stigma of fast food erodes our belief that some dishes could not possibly be healthy. However, I have a contender! 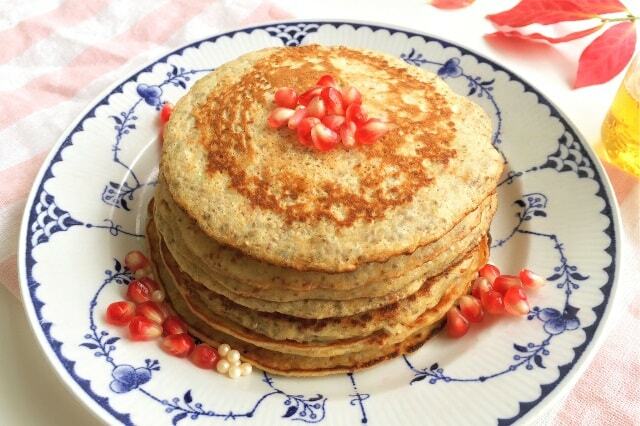 You won’t find a more delicious and nutritious meal than these Chia Banana Pancakes. You won’t find this superfood dish on the menu at any drive through takeaway. But your house might suddenly become the most popular place after school with these tasty treats. My little boy is still a few years away from his school years. But I want him to know healthy food and taste the difference. When he’s older, I hope he remembers how good his dear mum’s food tasted and how eating healthy is a way of life. I love to pack flavors into all my dishes and draw on my Lebanese heritage mixed with what I now have around me in Denmark where I now live. I hope you enjoy my first featured recipe on Super Healthy Kids and it’s exciting to have the opportunity to be seen on such a terrific page. Add the eggs, whisk until completely combined. Melt the butter, stir into banana mixture. Add the rest of the ingredients, blend well. Spray a large skillet with nonstick cooking spray and heat over medium. Add the batter to skillet, using about 2 tablespoons per pancake. Cook for about 1 minute until the pancakes begin to firm up; flip and cook on the second side until golden brown. Serve warm topped with fresh berries or pomegranate seeds, if desired. Would you be able to freeze these ? If so for how long ? Have you tried using all almond flour? We can’t use grain flours in our house. yes I have an it works fine with almond flour. Would it taste the same/will the recipe work without using almond flour at all? We haven’t tried it with regular flour, but if you do let us know how it turns out! ❤Our first pancake rule went like this: ” the first one you burn is yours”! We love it! That’s a great rule! I was wondering about soaking the chia seeds first to add more liquid and fiber so it is more absorbable to the digestive system. What are your thoughts, because I also found that the children with Autism that I work with aren’t big fans of a mixture of crunchy with their food. I was also thinking that chia seed pudding might work with some of the kiddos. Easy, tasty, and my 3 year old ate every last bite even while claiming she “didn’t want banana pancakes” so in my book it’s a winner!